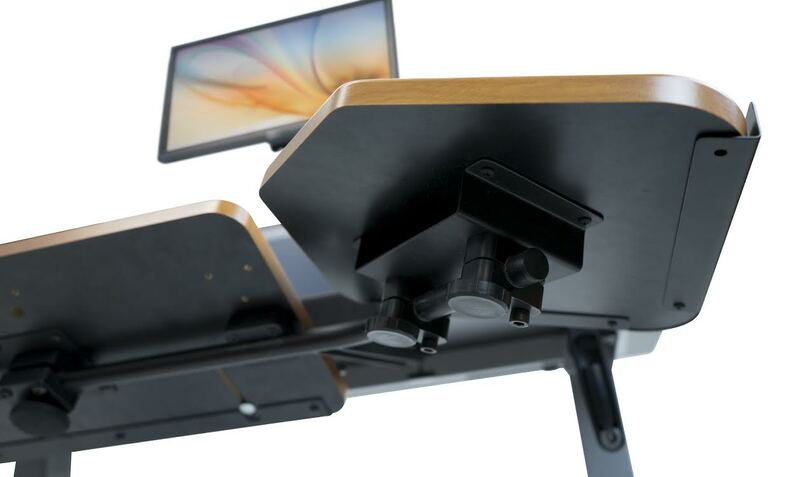 The iMovR Elevon is a completely new and unseen spin on the keyboard tray installs on any desk in seconds and solves the standing-ergonomics problem. The Elevon has three trays, one for the keyboard and one to the left and right, all of which tilt down so that your shoulders, elbows, wrists, and hands can hang in a near-standing position while you work. This is the only tray that comes close to providing the correct ergonomics for standing. The Evelon is currently available for purchase on Kickstarter. iMovR is known for exceptionally good working-while-standing products and the iMovR Elevon is a great fit to the product line. It attaches to the front of your desk without screws or bolts or holes and provides a work surface for your keyboard, mouse, number pad, phone, tablet, or whatever else you keep around you while you work. The cool part is that the work surface can be set to any incline in a 360-degree range. This means you can let your arms hang down and type when you are standing instead of using the incorrect 90-degree ergonomics of sitting. It means that your mouse and other accessories can be used without raising or lowering your shoulders or elbows since they are in the arc around the keyboard. As you saw in the product review video I actually lowered my desk to use the Elevon in the standing position since my arms were closer to hanging than bent at 90 degrees. 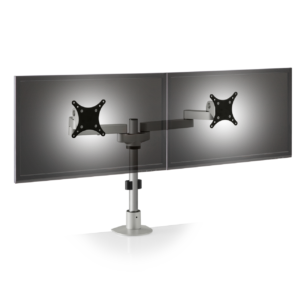 Adjusting your desk down means you will need a monitor arm that is extra tall since the distance between the desktop and your eyes increases with the Elevon. The materials in the Elevon are typical for the iMovR line. 3-Dimensional laminate is used and comes in a variety of colors. The metalwork is overbuilt for the task and the tensioners on the trays are confidently sized. This keyboard tray fits on any standard desk up to around 2 inches thick and with a width at or over 48″. It does move the work surface forward, essentially increasing your desktop space. 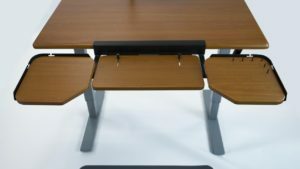 For desks that have less-than-desirable support with just two center-line legs, you may find that your desk bounces a little as you move things around since the weight is carried forward of the center line. High-quality desks will not have any problem with this. Using this keyboard tray you will find that you are able to type faster and be more efficient while you are standing. Over a decade of standing, you will also find less wear on your joints, tendons, and ligaments. 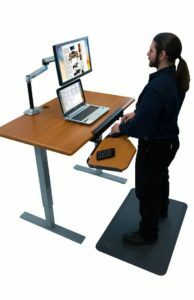 This is an easy investment for those of us who like to stand and do not have an iMovR Omega desk that already gets us in the right position. Upgrading to the Elevon is a worthy investment. In doing so, you should also consider the following products to complete your standing desk if you do not already have them. These make a huge difference in your comfort and the long-term suitability of your desk.